This course is designed for complete beginners to learn the physical aspects of Vinyasa-Flow yoga. If you are new to yoga and want to get into a fitness routine, or have sustained injuries through other forms of exercise or the type of work you do, this course will help you to find a practice which will build your strength and flexibility. Practicing Vinyasa-Flow yoga routines over time will enable you to increase your fitness levels as well as strength and flexibility. This type of yoga can be challenging on the body, and although a Vinyasa-Flow class can sometimes move quickly, being part of a beginners class you will have to opportunity to learn the basic form that the Vinyasa takes and build up on this over the 8 weeks. Every one in this group will be a beginner so you can feel comfortable to work at your own pace alongside other beginners. You can try the first session for a £14 drop in (subject to availability) and this will be deducted from the full course fee of £69 for 8 weeks (2 weeks free compared to our 6 week class pass also priced at £69). 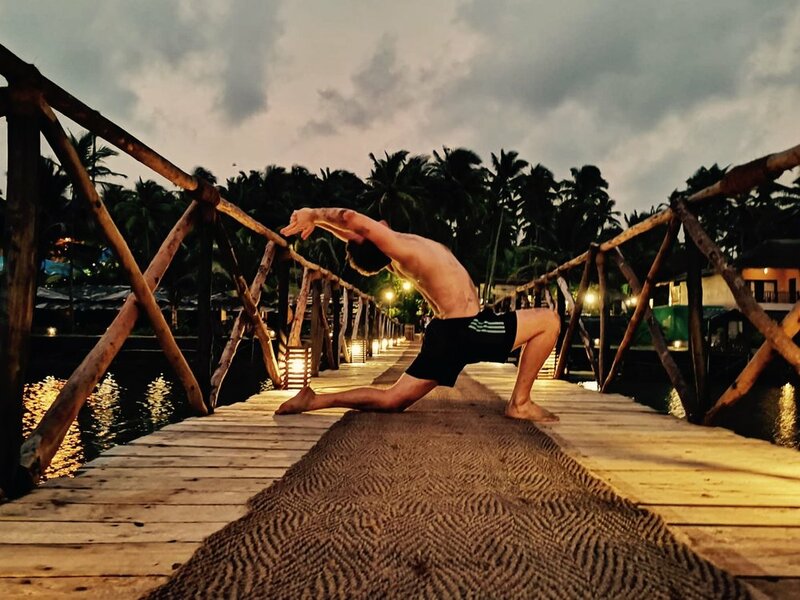 “I first got into yoga 3 years ago after realising my current sports (rugby and cricket) were no longer serving my body justice. After recovering from 2 hip operations, yoga stood out as the perfect alternative to improve on my mobility and physical health. As my yoga practice developed, I was able to move a lot better and I am now even able to weight train all because of my new found skill in yoga. When I embarked on a my travels to India last September, there was no better way for me to begin my quest than a 200hr Yoga Teacher Training. I loved every minute of it and I can now confidently practice on my own, using this new skill to keep my body in top condition to accompany everyday life and gym sessions. I now want to share what I have learned with the world as I now believe that everyone, no matter your ability, can benefit from incorporating yoga into their life. This not only keeps my body functioning in training, but I can now walk the dog without a limp due to the care and attention I give my hip before partaking in physical exercise. The strength I have built through yoga has surprised me as well so any lads that think they can't sustain or build muscle, I urge you to take a class or look up male yogi’s as the physical strength you need to practice is quit something. I like to incorporate some strength exercises in my own practice, but the beauty about yoga is that you can make it as challenging as your body allows - everyone is different and at different levels.